We discuss raising kids on the homestead, raw milk, raising cows, and also general philosophies on consumerism. You will definitely want to get over to http://stumblinghomestead.com and listen to Darcy’s excellent podcast. I particularly enjoyed the most recent episode about raw milk. Survival Gear Bags Giveaway Contest – SOS Style! Kelly over at Survival Gear Bags has seriously hooked me up with some cool stuff to give away! Don’t forget to use the link to the right and use the code “sos5” to get 5% off your order!! CAMMENGA – G.I. MILITARY PHOSPHORESCENT LENSATIC COMPASS (MODEL 27) – say that 5 times fast. So you want free stuff? One lucky facebook fan on our facebook page http://www.facebook.com/saveourskills is getting the map case and signaling mirror. In order to qualify you need to go over the the facebook page and hit “like”. If you “like” the SaveOurSkills.com facebook page by November 5th you qualify for the random drawing. Ok so I want you guys/girls out there in cyber space to decide which skill I should endeavor to undertake next. In this email please include a link or description of a practical project. Try to make it something feasible. For example you could explain to me how to use PHOSPHORESCENT LENSATIC COMPASS. Also I’m fine with spending money, but let’s keep the budget under $200 to complete the project. That should give you plenty of room to work. You can give as much detail or as little detail as you would like, or simply give me the link to the project online. On November 19th at 7PM the post with the most facebook “likes” wins the contest. Q: What if I fail to read/understand/follow the instructions? Q: What if I refuse to join facebook, is there a way I can participate? Q: What if I send you a skill about how to stab yourself in the leg (or any other idiotic thing)? So this wouldn’t be a very good Save Our Skills blog post if I didn’t incorporate some awesome DIY project. I decided I needed some really top notch product photos so I built a light box. Check out the video below and then scroll down for some cool pictures of the giveaways. Note: In my version I drilled out the threaded area of the connectors… after I finished I checked out the picture again and noticed that they used a bunch of extra elbows to get around my problem… but mine was cheaper. A few points to make it cheap… the less parts you buy = cheaper. Second … for anything you use PVC for in project use electrical conduit instead. WAY cheaper… I get those 8 foot sections for 92 cents at lowes vs $3 or $4 for PVC. p.s. I’m not even close to a pro photographer. I plan to graduate from auto this winter (yet another skillset to learn!) I think I needed to adjust my F-Stop or something… the focal area was too narrow on some of them. Author Nick-LaDieuPosted on October 28, 2010 Categories Blog4 Comments on Survival Gear Bags Giveaway Contest – SOS Style! This post could have just as easily been called, “how to get your family to eat organ meat.” I eat organ meat regularly, because it is even more nutrient dense than the muscle meat. I’ve read that Native Americans and Eskimos instinctively knew this, and ate the organs from freshly killed prey, while tossing much of the muscle meat to their dogs. But this argument holds little weight with family members conditioned to have a gag reflex at the sight of organ meat sizzling in the pan. 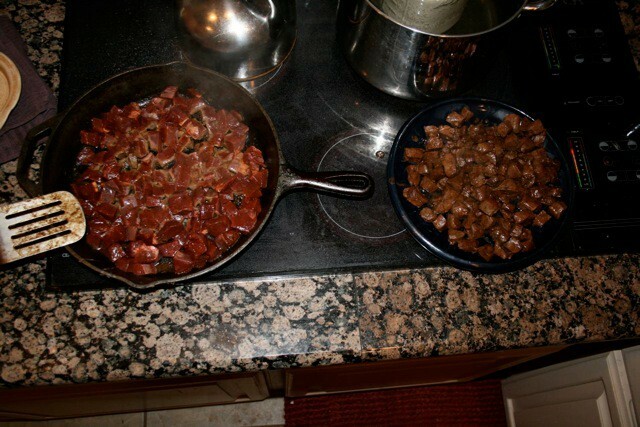 The solution: mix organ meat into spicy or otherwise flavorful dishes. 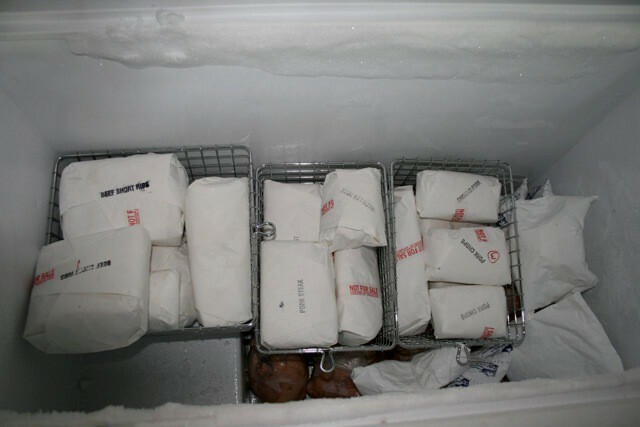 Do so in a reasonable ratio to other traditional meats, and your eaters will be none the wiser. An added benefit of this is cost: for families trying to stretch their protein budget, organ meats can often be obtained at a fraction of the price. 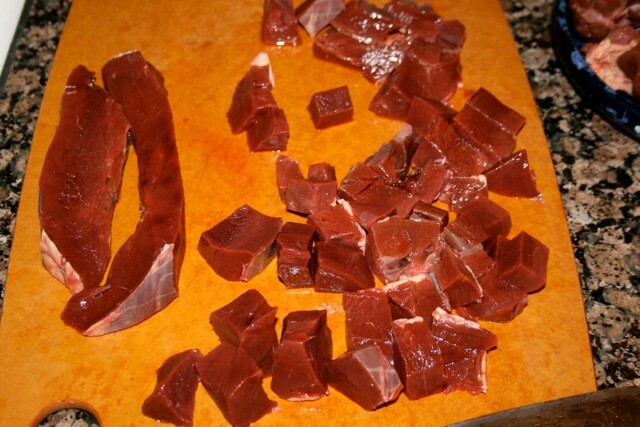 I recently got twelve packages of liver and three beef hearts for free, because no one else wanted them! And as you’ll see by the following pictures, that’s an awful lot of free, nutritionally-dense protein. 1) Thaw the heart in the refrigerator. Bring it to room temperature for a couple of hours prior to cooking. Rinse off any blood. Yep, looks just like a heart, doesn’t it? Notice the innards, and ventricle structures. I let my toddler help me cut it up (holding the knife with him) and it becomes like a mini science class combined with a food preparation lesson. Instead of wrinkled noses, turn it into fun participation. 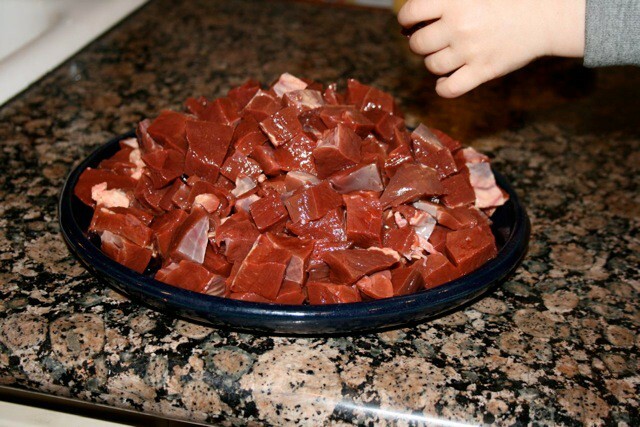 2) Cut it into small cubed chunks. 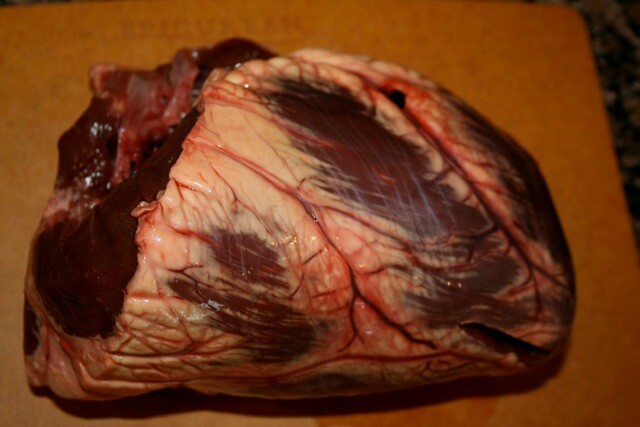 With the exception of a little bit of tougher ventricle structures inside, most of the meat cuts very easily. I leave most of the fat on, because I’m a believer that we need all the good fat we can get in our diets. 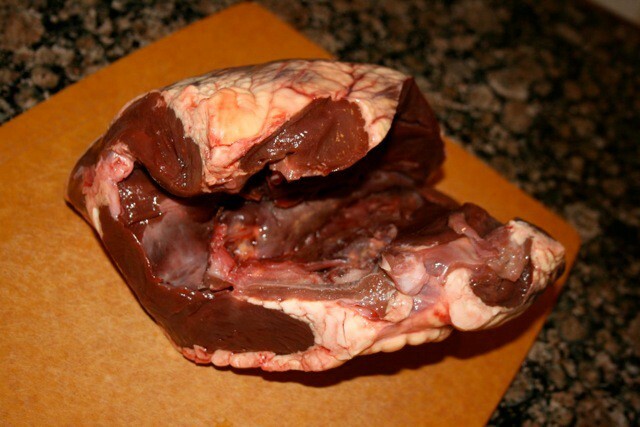 3) Here’s how much meat you get from a single heart. I told you it was a lot of protein. Again, for free. 4) I pan fry (med-high) the meat in butter, with sea salt, pepper, and paprika. Even though I drained the blood at several times during the cutting, I think that the heart tissue holds more blood than other tissue. Notice the good amount of liquid in the pan. This is not a bad thing, because you end up with a rich tasty sauce to add to the chili. But for those looking for a seared effect, you probably want to grill the meat. 5) The final step is to put the cooked meat into the food processor, on low pulse, to grind it up a little before adding it to the chili. This will help disguise it, and let it absorb the spicy flavor of the chili, so that your family won’t even know. I added about a third of the meat, to the two pounds of ground turkey that was already in the chili. Use your favorite recipe for chili, and I suggest substituting about 1/3 of the meat with the ground heart. You could probably grind the raw meat and throw it directly in the chili, but we don’t have a meat grinder, so this method works just fine. 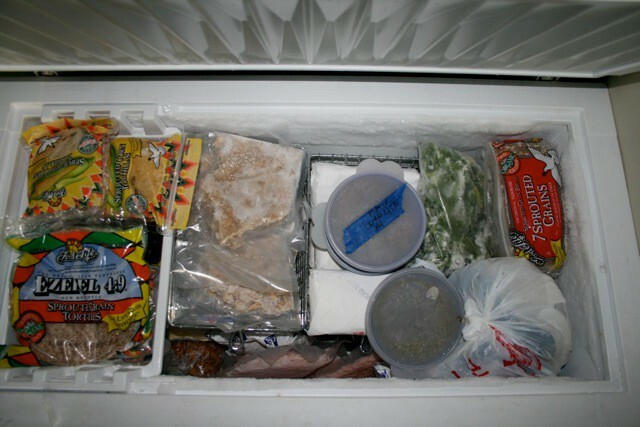 I freeze the remaining cooked chunks for addition to future dishes. Note: this sneaking in of organ meat doesn’t work so well for burger patties. Try it and you’ll most likely get busted! An additional point: I put aside a small plate of the cooked heart chunks and sauce for myself to eat, outside of the chili. Very tasty. There’s a little bit of that wild organ taste going, but the texture is remarkably like a cut of steak. My toddler wanted to try a piece, and he liked it, and asked for more. I couldn’t convince my wife though–too reminiscent of science class for her, no matter what the taste or texture. Has to be hidden in the chili for her to eat it. This is an important point for parents: if you want your kids to eat trickier foods like this, you’ve got to genuinely enjoy it yourself. If my wife had tried to feed it to him, I’m pretty sure he would have turned his nose up at it. But he sees me enjoying it, and opens his mind up to experience as well. So if you want your kids to eat better, you’ve got to eat better yourself first and mean it. Jon and Julia Martinez join me on the podcast to talk all about cloth diapers, making your own baby food, breast feeding, and more! This episode is important to me since my wife and I are expecting a child this coming May. I hope some other young parents find this useful. If you have anything to add lets hear it in the comments. Keep the solution in a resealable container. (we use a plastic container from disposable wipes) When you are ready to use a cloth wipe, dunk it in the solution and squeeze out the excess. Don’t double dip! Don’t follow the advice of one guru, just do what works for you. If you want to use a disposable part of the time go ahead and do it. Many brands were tried, learn what worked for them. My great Aunt Gladys published her memoir recently, sending a copy to my Mom. In it, she details a curious method for storing meat which I had not heard: packing meat into a crock with layers of lard above each layer of meat. Now, great Aunt Gladys was born in 1915 in Iowa to parents both with ancestry from Kreis Schlawe in eastern Germany. This is the Kreis (county) east of the Oder river and south of the Baltic; a northern climate with a fair amount of cold. Iowa can also prove cold from October until March (and sometimes May). She does not detail whether the meat was cooked prior to layering in the crock, but a possible hint is her use of “heated them up”. I would guess the meat was cooked, then layered in lard. My food preservation guides don’t mention this approach to food preservation; it seems to have been mostly a lost skill when ice box and later refrigeration became available. One can understand why they would rapidly shift away from such a packing method with botulism and other possible nasties. Still, though, it seems important to at least document the process, step-by-step, especially including the rules for testing and use later. All of the preservation processes I’ve seen include a dose of salt, which does help control some of the nasties. Aunt Gladys does not mention salt. If the pressure canner is available, I would highly recommend meat be canned using appropriate canning technique. One interesting similar method for storage is the “confit”, a French term for “preserved”. The Ochef site documents a recipe from “The New Making of a Cook” by Madeleine Kamman. 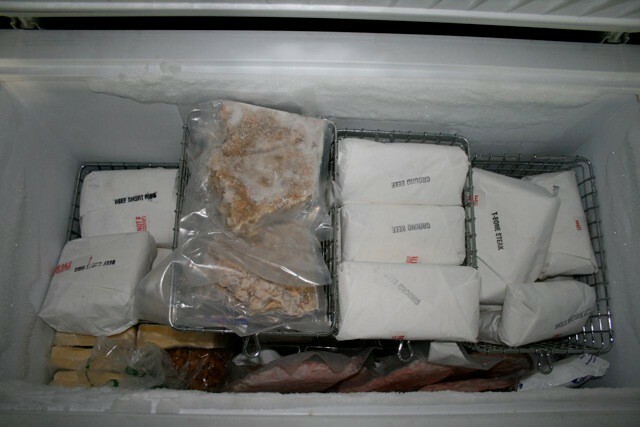 Still, even after all of the processing to make the confit, they recommend storing it in a refrigerator. Donna from the SaveOurSkills.com facebook page added this useful tidbit.